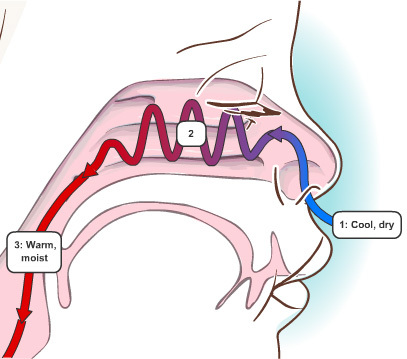 This illustration demonstrates how the nasal cavities affect the temperature and moistness of inhaled air. (1) When a child breathes in, cool air enters the upper airways through the nostrils. (2) The turbulent air gets warmed, cleaned, and moistened as it flows over the walls of the nasal cavity. (3) The warmed air travels down into the lower airways and lungs.